As Europe ramps up its investment in wind power, turbines have bloomed like wildflowers across the continent. Wind-energy production has more than doubled — from 150 terawatt-hours in 2010 to 364 terawatt-hours in 2017 — and now makes up more than 11 percent of the European Union’s electricity, according to a report by Agora Energiewende and Sandbag. Germany now generates so much wind power — more than 106 terawatt-hours in 2017 — that on blustery days in the north, high-voltage transmission lines carrying all that power to the southern part of the country sometimes have to divert excess electricity to neighboring countries. But these wind farms also need tending. As turbines age, so do their blades. Some of Europe’s turbines have been operating nearly 24 hours a day for 18 years. Their slender blades — some are as long as the wingspan of a jumbo jet — are under considerable stress from wind, sea, rain, sunlight, lightning and freezing winters as they rotate and generate electricity. Identifying problems in blades early is vital for operators and owners to keep costs down and assets running. No wonder that maintaining these blades is now a growth industry in Europe. LM Wind Power, a GE Renewable Energy subsidiary that manufactures turbine blades, has hundreds of thousands of blades working on about 90,000 turbines globally, including 35,000 or so made for GE turbines. The holy grail of maintenance is spotting small flaws in turbine blades before they become big, costly ones. The blades are made from composites — handmade materials assembled from alternating layers of fiberglass, balsa wood and resin. Over time, these composites can develop minute imperfections that can, if left untreated, disturb the airflow over the blades and degrade their performance. Big repairs that require the removal of the blade from the turbine are often logistical headaches resulting in significant expenses for wind-farm operators. They’re also complicated endeavors, requiring skilled technicians on cranes or ropes, and they can take a turbine out of commission for weeks or months. But finding flaws early isn’t easy. They often hide inside the blades themselves, invisible on the surface. One approach used by GE Renewable Energy employs thermographic cameras that can sense the heat from the friction between the fiberglass layers occurring when a flaw has developed deep inside a blade. The company is also developing acoustic sensors, which use sound waves to detect flaws. The data from the measurement feeds machine-learning algorithms that help engineers assess the severity of the flaw and prioritize repair. A cosmetic flaw would be a category 1; a large crack on the verge of catastrophic failure would be a category 5. Repair costs rise dramatically with the severity of the flaw. 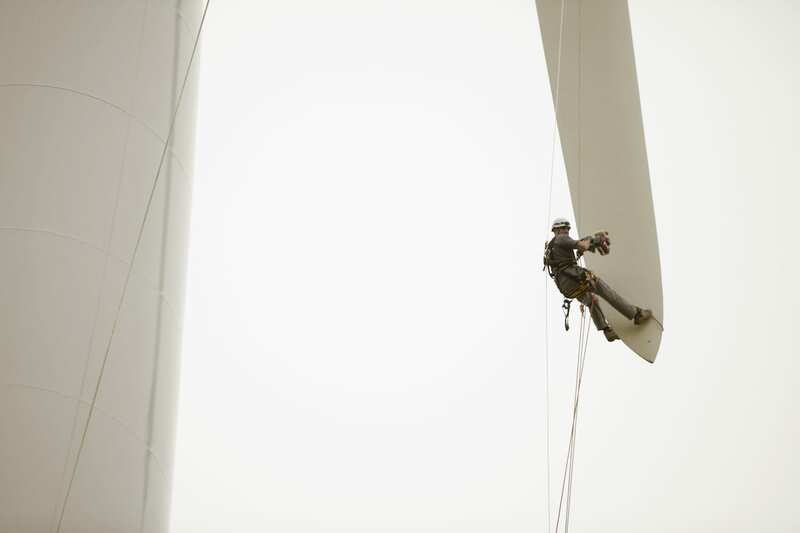 Naturally, LM Wind Power technicians aim to find flaws early and fix the blades while they’re still attached to the turbines. Usually this is done from a platform, but sometimes it requires deft use of ropes and harnesses. For this reason, a disproportionate share of the 250 repair technicians at LM Wind Power are mountain climbers in their leisure time. Once the technicians reach the place on the blade that needs repair, they grind down the area of the blade around the flaw and rebuild it on the spot — adding alternating layers of fiberglass and resin by hand, and sculpting the final shape to make the flow of air over the blade as efficient as possible. Read the full story at GE Reports.